Have you ever been assigned to follow someone on the freeway? As you drive behind them it becomes easy to evaluate their driving. They are going too fast, too slow, didn’t change lanes soon enough, almost hit that car by changing lanes too quickly. No, we would rather be in the lead, and be the one in control. For many, following Jesus can be like following someone on the freeway. It is difficult to simply follow Him, especially when we see Christianity as a series of do’s and don’ts, or as Andy Stanley likes to call it, a game of “Jesus Says” (Like Simon Says). In his book, Follow, Stanley helps to break down our misconceptions of what it means to follow. If you could somehow erase everything you’ve heard about God, Jesus, the Bible, and religion, and start with a blank slate, you’d find that the writers of the Gospels – Matthew, Mark, Luke, and John – didn’t present faith as a game of Jesus Says. In fact, they said faith is extraordinarily relational. They claimed Jesus didn’t come so we can do whatever arbitrary thing He says, but so we can learn to live like children of God… to follow Him. 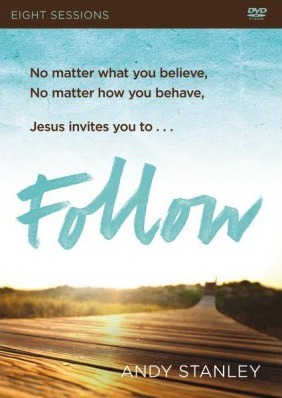 Regardless of where you are on the spectrum of faith, Jesus’ invitation to follow is for you. Jesus extended an invitation to follow to every single kind of person imaginable – rich people, poor people, people who were spiritual, people who weren’t spiritual. He didn’t place a bunch of conditions on His offer. He just invited them to follow. Jesus was extraordinarily comfortable with people who weren’t anything like Him. Based on what we read in Matthew, Mark, Luke, and John, people who were nothing like Jesus were extraordinarily comfortable with Him too. Have you ever met someone who is so comfortable with himself, he makes everyone else comfortable? Jesus was like that… a hundredfold. That’s a big deal because Jesus was God in a body. He wasn’t obligated to make everyone around Him feel comfortable. Based on all the sin in the world, He would have been entirely justified in making everyone feel uncomfortable. But Jesus was so comfortable in His own skin that He didn’t hesitate to hang out with sinners, outcasts, lowlifes, and even tax collectors like Matthew. It’s easy to dismiss the Pharisees as being small-minded and intolerant, but put in the same situation, we’d all be tempted to ask the same question. After all, Jesus was like them. He was a rabbi and they were rabbis. He was a law-keeper and they were law-keepers. He was holy and they were holy. So, why would Jesus choose to hang out with people who were nothing like Him – people who were far from God – instead of hanging out with people who believed in the same religious rules and traditions? Now, imagine that Matthew was sitting right there when Jesus responded to the Pharisees. He heard what Jesus said. A guest in his home, at his dinner table, called him and his friends “the sick.” Maybe Matthew was offended. Or maybe, because he was a tax collector, he already knew he was sick. The truth is, when it comes to sin, we’re all sick. It’s not enough to believe right. It’s not enough to behave right. Christians who are content with that eventually become Pharisees. They become judgmental. They become the ones who demand that others change before they can begin to follow Jesus. But Jesus called sinners and unbelievers to follow Him. He didn’t demand that they change first. He didn’t even demand that they believe He was the Son of God. He knew that if they just followed, if they just took a step in His direction, it would change them. 1. Did you grow up in a church that emphasized doing what Jesus says over following Him? Or if you didn’t grow up going to Church, did you assume that’s what Christianity was all about? How has the “Jesus says” mindset affected your spiritual journey so far? 2. Jesus was extraordinarily comfortable with people who were nothing like Him. How might your community, your nation, and the world be different if the Church treated people the way Jesus did? 3. In Jesus’ culture, tax collectors were considered the lowest of the low. What kinds of people occupy that position in our culture? Is it challenging for you to believe that Jesus would extend an offer to those people to follow Him? Why or why not? 4. How comforting is the idea that Jesus wants everyone to follow Him regardless of what they believe or how they behave? How is it challenging? 5. 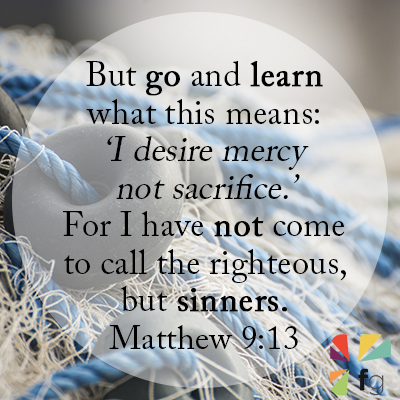 What are some things that make it difficult for you to follow Jesus? 6. What is one thing you can do this week to begin to follow Jesus or to follow Him more closely? 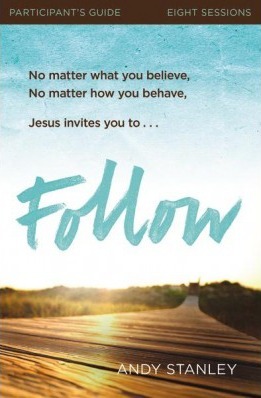 Jesus’ invitation to follow is for you. Being a sinner doesn’t disqualify you; it’s a prerequisite. Being an unbeliever doesn’t disqualify you. The invitation to follow is purely an invitation to relationship. It’s not an invitation to obedience. It’s an invitation to a relationship with your Father in heaven. Join the conversation on our blog! We’d love to hear from you! Buy the DVD & the Participant's Guide!